In 1909 a new cargo ship was launched from the Rijkee & Co. N. V. shipyard in Rotterdam, Holland. It was a 2624 gross tons ship 99.6 metres long, 13.4 metres wide and 5.7 metres deep. It was built of steel and powered by a single 202 nhp triple expansion engine built by Werkspoor N. V. of Amsterdam. Steam came from three coal powered boilers. The ship was named SS Pollux and it had a maximum speed of 10 knots. The owner was Koninklijke Nederlandsche Stoomboot Maatschappij (KNSM) of Amsterdam. I have not been able to find any indication of what routes the ship worked on or what it carried. Strangely, in 1918 the SS Pollux became a United States of America warship, albeit a transport ship. It was named USS Pollux (SP 2573). However, this was only for a very short time, from 3 to 24 April 1918. I suspect that it was chartered or seized and that this may have been for one trip across the Atlantic bringing troops or equipment to Europe from the USA. 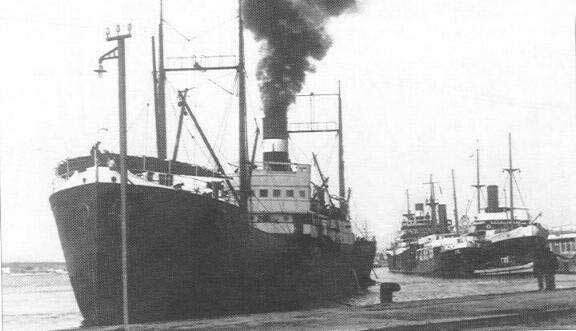 The SS Pollux returned to service with KNSM and stayed under their ownership till 1930. In that year (or perhaps 1931), ownership changed to SA de Gerance et d'Armement of Dunkerque (Dunkirk), France and renamed SS Tabarka. She stayed in their ownership till 1940 when she was taken over by MOWT (Ministry of War Transport) of London, England. She was seized at Falmouth in Cornwall, England, in July 1940. This was after the fall of Dunkirk. On 23 March 1941 the Tabarka was scuttled in Kirk Sound (No 1 Barrier) which is the eastern entrance to Scapa Flow, Orkney Islands, Scotland, the main Royal Navy base. After the permanent Churchill Barriers were built there, the Tabarka was refloated on 27 July 1944 and moved to Burra Sound at one of the north-western entrances to Scapa Flow. She was resunk here. Burra Sound is between the large island of Hoy and the smaller Graemsay. This was done to block off this shallow entrance to ensure that German vessels, especially submarines, could not use this entrance. 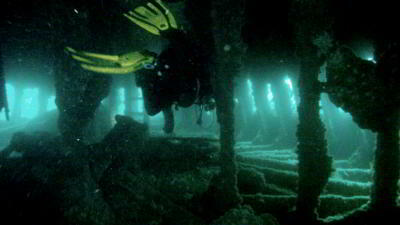 The original work on the barriers and blocking other entrances was done after a German submarine, U-47, snuck into Scapa on 14 October 1939 and sank the battleship HMS Royal Oak. Of Royal Oak's crew of 1,234, 833 were killed that night or died later of their wounds. 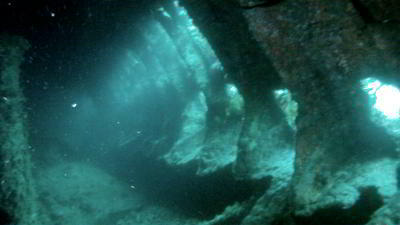 As you can see from the above photo, the wreck is in a relatively narrow channel. It is shallow, about 12 metres to the top and 16 metres maximum. You can only dive the wreck on a slack tide, and even then you will only have a short period during which it is safe to dive. We dived it at high slack. As the current started to drop off, our boat went up current and we dropped off the boat into the water. I was first to go and I only just made it to the up current side of the hull. In fact, I had to swim down over the hull to the bottom. Today the ship is upsidedown and I assume it has been like that since 1941 when it was scuttled. The ship faces across the channel, with the bow pointed towards the east. The ship is broken into two sections, just in front of the boilers. Once you are on the bottom you should have good visibility. We had in excess of 12 metres outside the wreck and about 20 metres inside. The bottom is composed of rock with lots of kelp. When you hit the wreck, you can swim either direction, no matter whether you are up or down current or on the bow or stern section. When I hit the bottom I swam to the west to the stern. However, when I got there I did not think I could enter so I swam back to the middle section. As I approached the break I had a very large seal come up to me. From here we entered the stern section. Straight away you will see the first boiler on your right. This is intact and sitting as it would have in the ship (albeit upsidedown). 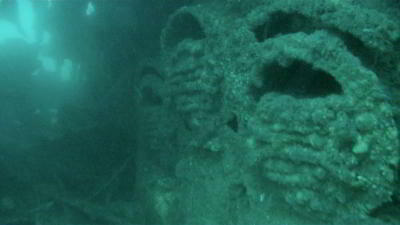 The middle one is tilted forward and the third one is a bit damaged and pushed to the other side of the wreck. 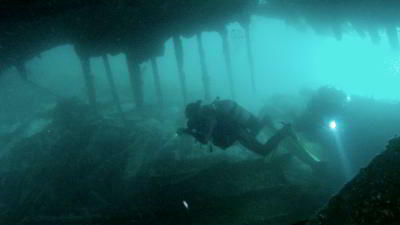 The inside of the wreck is like a large cavern or small cathedral. There is a lot of light coming in from the outside through the rusted lower sections of the hull sides (actually the upper levels if the ship was still upright). You can easily swim between the boilers and end up in the engine room. 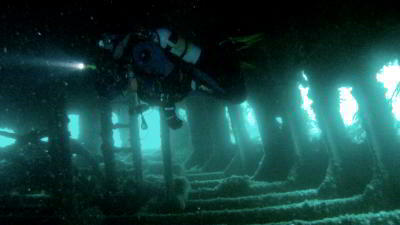 The large triple expansion engine lies in the middle of the wreck. You can swim behind and around it. 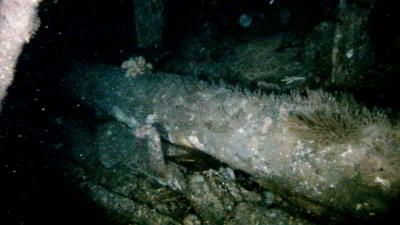 The drive shaft can be seen exiting the back of the engine and then inside the shaft tunnel. You can follow it all the way to the stern. Outside the wreck there is no prop, it was obviously taken off before the ship was sunk. 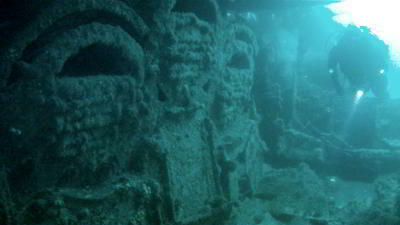 The ship appears to have been filled with rocks when it was sunk as they are all over the bottom, having fallen out when the ship turned over. These were presumably put inside to make the ship heavier when it was scuttled. There is also a fair bit of coal. Swim back to the boilers and then across the gap between the two sections. It is about 15 metres across. At this stage you have probably been down about 20 minutes, so there should not be any current. Enter the bow section. This is even more open than the stern section, as there are no boilers or engine. There is an upper and lower level, created by a lower deck. Remember it is all reversed, so up is down and down is up! You can see Hold 2 here quite clearly and in front of it there are a row of stanchions. You need to be careful as you slip through to the forward section. This will take you into the 'tweeen deck of Hold 1. 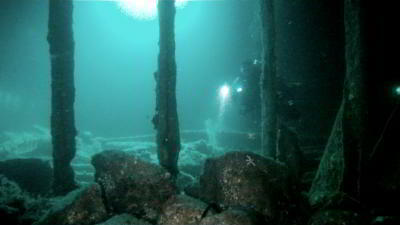 At the front of the hold you can see what would have been the chain locker and outside the wreck. You can go a bit higher (to a lower level) and then come back over Hold 2 and out the break. By now the current will be starting to run in the opposite direction. If it is not too strong, go back into the boiler and engine room area for some more exploration. We exited the wreck at 37 minutes and went down current from the wreck. I deployed my SMB and we started our ascent. We drifted for about 10 minutes doing a safety stop before surfacing. Despite my concerns about doing this wreck instead of one of the scuttled German WWI wrecks, it was a very enjoyable wreck. If it was anywhere else it would be an attraction in its own right. 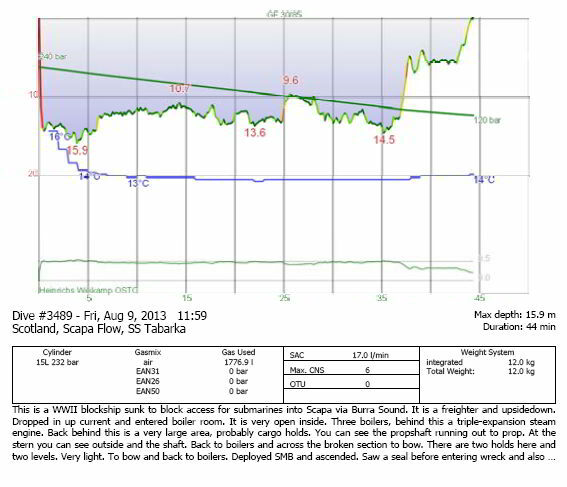 The water temperature on this dive (early August) was 13.1°, very warm for Scapa Flow. NOTE: Photos taken from GoPro video footage.